The first of its kind. Hackable. Peculiar. Elegant. Powered by Arduino. Available as a DIY kit or fully assembled. I present to you the Fibonacci Clock, a clock for nerds with style. Beautiful and fun at the same time, the clock uses the famous Fibonacci sequence to display time in a brand new way. The Fibonacci Clock has been designed for curious and inventive people who like a time piece that keeps them on their toes. The clock comes fully assembled and ready to use. Just unwrap it and plug it in. You will find an instruction manual and many other documents on the project website at http://www.geekoclock.com/support. How do I tell time on the Fibonacci Clock? The Fibonacci sequence is a sequence of numbers created by the Italian mathematician Fibonacci in the 13th century. It’s a sequence starting with 1 and 1, where each subsequent number is the sum of the previous two (1, 1, 2, 3, 5, 8, 13, 21…). The hours are displayed in red. The minutes are displayed in green. When a cell is used to display both the hours and minutes, it turns blue. To read the hour, simply add up the corresponding values of the red and blue squares. To read the minutes, do the same with the green and blue squares. The minutes are displayed in 5 minute increments (0 to 12) so you have to multiply your result by 5 to get the actual number. Often, there are multiple ways to display a single time. To add to the challenge, the combinations are picked randomly from all the different ways a number can be displayed. 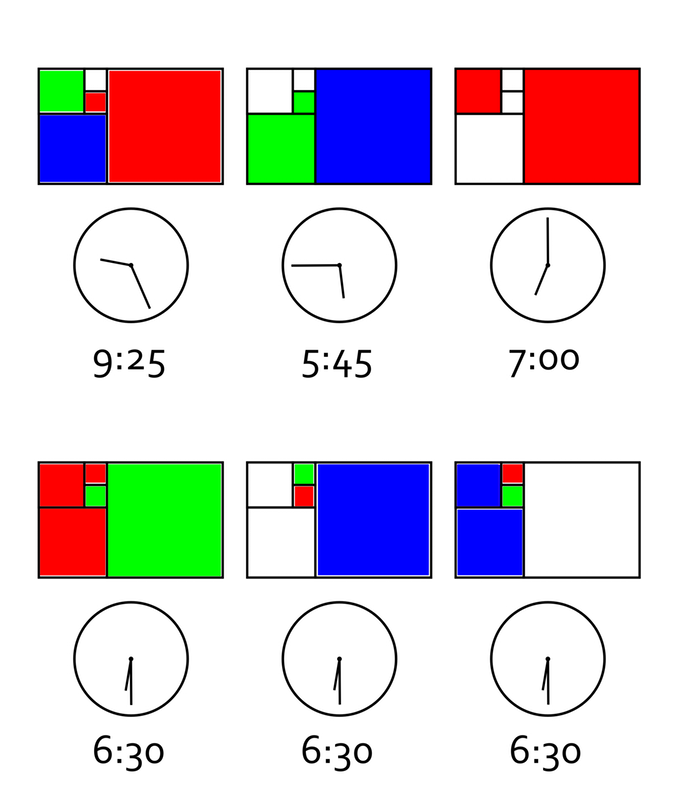 There are, for example, 16 different ways to display 6:30 and you never know which one the clock will use! This clock is built out of high-quality birch plywood with two coats of varnish. Durable, dependable, and affordable, it’s a staple in my workshop. Walnut, teak, and maple finishes are also available. The Fibonacci clock is driven by an Atmega328 micro-controller running Arduino. That means you can change the code running in the clock using the official Arduino IDE. The possibilities are as infinite as the Fibonacci sequence! To make it easy to hack, I have included an FTDI connector so that you don’t have to remove the chip to reprogram it. On top of that, a yellow LED has been connected to pin #13 to help you debug your application. The Fibonacci Clock is an open source / hardware project. The source code, the schematics, and the enclosure plans are available to the public here.